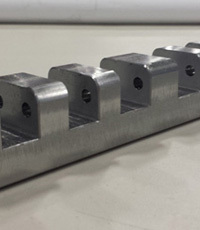 Our ability to apply innovative precision drilling techniques to a variety of part types allows our team at Midwest Precision Manufacturing to assist customers with challenging projects. The part shown here is a track link used in the heavy equipment industry. The link is machined from 1215 steel and includes two 0.234" holes through the entire 9" length of the part. Initially, the customer had not found a way to drill the holes through the interrupted cuts and had resigned to scrapping the entire design. This would have added additional development costs and resulted in the customer being late on delivery. While drilling through interrupted cuts is significantly more difficult than drilling through a solid piece of material, we were able to develop a method to efficiently drill the parts while holding tolerances as tight as ±0.002". The finished part has a length of 9", width of 1.375", height of 1.375", and a surface finish of 125 Ra or finer. Visual and dimensional inspections were performed to verify conformance to all applicable specifications. For additional details regarding this custom deep hole drilling project, see the table below, or contact us directly.